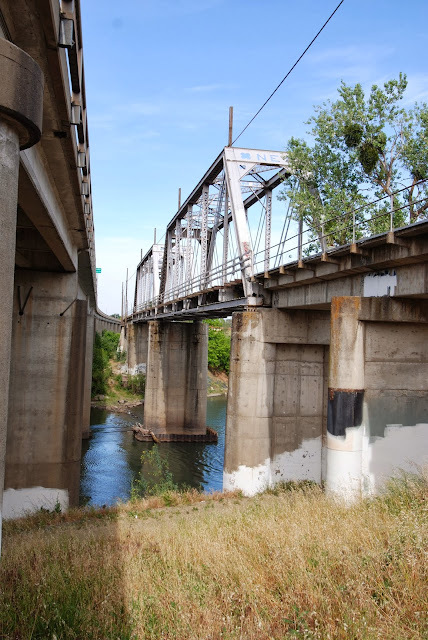 The Feather River (or 5th Street) Bridge (12C0012) is about to be replaced with a bigger bridge further to the north of its historic neighbor. The existing bridge is an 1,865 ft long precast simple span I girder bridge that was built in 1958 and widened with a 10 ft pedestrian and bicycle path attached to the north exterior girder with steel braces (see photo above). This bridge will be replaced a little upstream with a four lane bridge with bigger sidewalks and shoulders. Meanwhile, the historic Twin Cities Bridge will remain and (hopefully) be improved with a deck to support pedestrians and bicyclists. On the west side of the river (in Yuba City) 5th Street, which is now Bridge Street crosses over 2nd Street with a similarly designed two span bridge that was also built in 1958 (see photo below). More information on all of these bridges can be found in the Environmental Impact Report for the replacement bridges. Yuba County, California Bridges: 5th Street Bridge across the Feather River by Mark Yashinsky is licensed under a Creative Commons Attribution-NonCommercial-NoDerivs 3.0 Unported License.